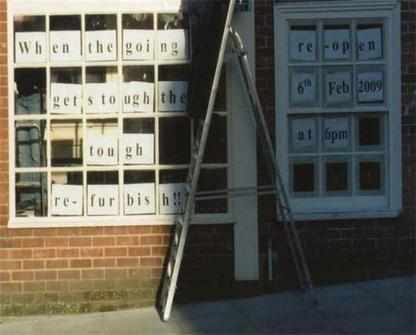 THE owners of an award winning business in Warminster have shown they still have a sense of humour as their part of the town lurches towards an uncertain economic future. It was ten years ago that Mark Brassington and Jacqui Tatnell opened their restaurant and tea rooms in the High Street. Since February 1999 they have seen businesses come and recently mostly go as they firmly established the reputation of Jacquelines across the south west. Mark Brassington has recently been outspoken in his defence of car parking spaces for the High Street, George Street and Silver Street. They had been voted 'Best tea room in the West' and in Wiltshire within 19 months of opening. They have been recognised by the Tea Council which has invited them to join the Tea Guild. With the Christmas period over and a decade of serving up their distinctive home cooked food including the Warminster burger they have closed their doors. Their choice of three dining or tea rooms with beams that date back to Henry VIII, and a garden area, will re-open on Friday 6th February in time for the evening diners.